Talentbridge Delivers ... locally delivered solutions with global reach. Thanks to HR Advisory. We provide expertise determining the right assessment for you and your organization. We have access to hundreds of different assessment tools and techniques to assess your culture, your leadership, and your development opportunities. Allow us to position your new leaders for success moving forward and ensure that they are intentional in their leadership at the outset of their role with our onboarding coaching. Our Leader Onboarding Strategy accelerates time to contribute, reduces turnover, and maximizes return on investment. Leveraging your key talent is the fastest way to maximize return on investment in your people. We partner with your leadership team to identify opportunities to propel your high potential employees to the next level. 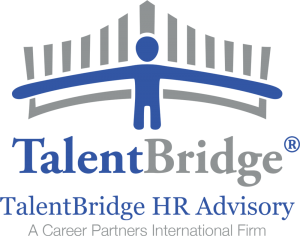 TalentBridge’s executive coaches collaborate with senior executives to assess and prioritize talent management strategies to align with your organizational goals. Successful transition programs also reduce potential litigation, lead to faster time-to-land with impacted employees and enhance relations with remaining employees and the community at large. Our transition services help displaced employees from anxiety about their present situation to successfully navigating their career transition. Our certified HR professionals offer experience in all functional areas of human resources from a wide variety of industry backgrounds. We understand the pressures of your job and we invite you to use us an extension of your department for consulting, special projects, and part-time support. Recruitment Process Outsourcing (RPO) is a logical step for corporations as they recognize the need to outsource small and large-scale recruitment projects. RPO is increasingly used as a strategic initiative to address the lack of resources and infrastructure in human resources departments.